We've been attacking the first cut or two of Bermuda in our rough with herbicides to reduce its competitiveness over the last month or so. With this reduction means we will need to start some new seedlings of Fescue in areas where we have less than adequate cool season turf, thus its time to start drill seeding our rough. We will be drilling in high traffic rough areas around greens and fairways in an effort to get a stand of grass before winter sets in. It is difficult for young seedlings to make it in our environment with a great deal of shade, mowing/blowing equipment and cart traffic. Hopefully we will get the turf up and growing before the main onslaught of leaves start to fall. By then it will have been fertilized and we should be in good shape for next season. We hope to get this grass up and growing in 10 days or so and look forward to it competing with the Bermuda that survives the winter and from the various chemical treatments it has received. Video below explains our process. What Are Those Lines On The Greens? The lines on the greens are from vertical mowing(verticutting) we performed on the greens on Monday. The mower has approximately 32 blades on each unit with 3 units on the mower. These blades cut into the surface of the green at a setting that we chose. We set the mowers about 1/4" below the surface which is not real deep but will do its job. 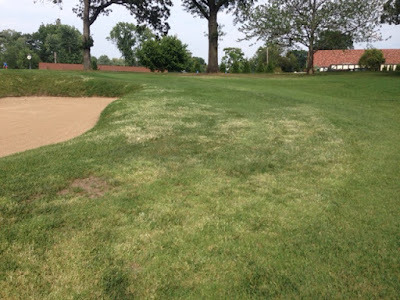 Bentgrass from its name and nature grows upward and then sideways as much as we allow it. The bent over growth habit makes it difficult for our mowers to get a clean cut. Vertical mowing helps to improve our overall cut by cutting off longer blades and standing the turf upright. The reduction of longer blades ultimately reduces drag or friction on golf balls improving ball roll out. We topdressed and brushed the greens as well which also helps our mowers make a better cut. 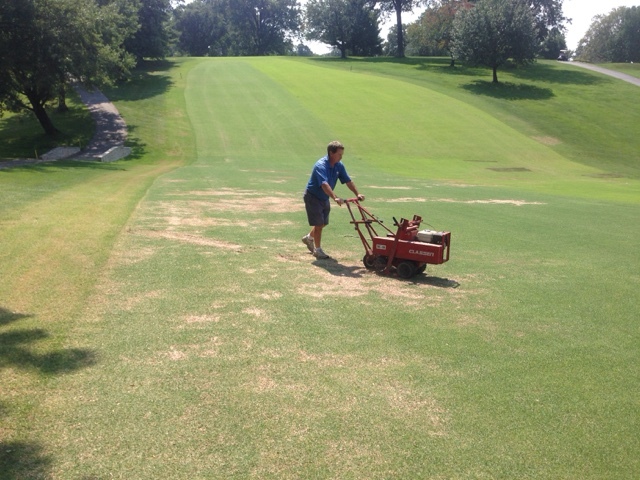 The brushing stands the blades up even more and gets the sand down into the surface of the green. The sand protects the crowns which are the place where roots and stems originate. The sand goes down into the channel, mixes with the thatch helping to dilute the total amount of thatch that is accumulated from leaves and roots dying. The verticutting also thins the turf slightly which encourages the plants to generate new leaves. The excess blades piling up after the mower goes over it. Longer blades being cut or stood up in preparation for brushing and mowing. As with all cultural practices performed on greens, speed might slow slightly for a couple of days but should improve as we mow and roll. Contacted Tim Gamma today regarding Oak trees on property that are showing some significant stress. Some of this occurs from drier conditions that we have faced over the last few weeks. Send him a picture of a large Pin Oak between 8 and 10. He stated its a classic look of Bacterial Leaf Scorch that is effecting Oaks all over the city. The link from Missouri Botanical Garden discusses bacteria and how it effects the tree. Tim said for the most part trees will survive the issue unless it has other significant health issues. Bacteria moves throughout the tree through the Xylem, Phloem, that is why you see whole limbs being infected from where it attaches to the trunk to the top. Today I finished spraying the fairways of our Bermuda Eradication spray. I also sprayed 4 acres of rough on the front 9 as well this afternoon. I need to spray greens surrounds and the back 9 in the next few days. More reports will come your way as the work is completed. Marketer, heck yes, when you spend as much time as we do as growers of turf, you want people to see your product being used. 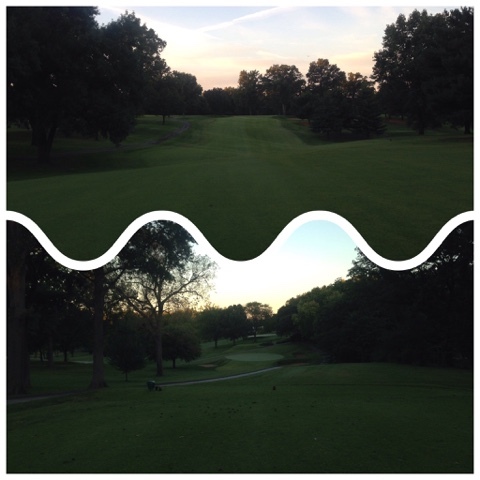 Who needs #Fantasyfootball when you as a member of #Glenecho have this! Killer weather and conditions. Set the DVR and come see us. Between club championships, group events, outings, and some nice play days, a great deal has been happening on your grounds over the last couple of weeks. Our last application of our Bermuda Eradication products took place on Wednesday on holes 1-12. 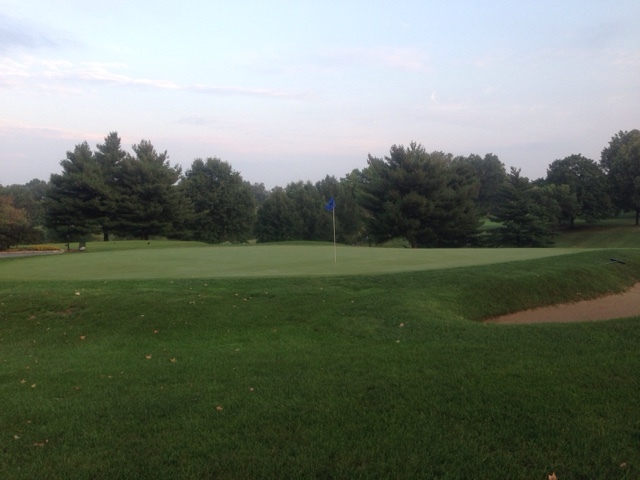 Higher winds and play in the mid-morning time frame prevented me from spraying all 18 holes. They will be completed early next week. Along with our last application of spray, we will be raising the height on the fairway turf in the next couple of weeks as we prepare it for winter. I will be watching temperature forecasts and growth rate of the turf to determine when this will occur. The latest would be sometime around the first week of October. The herbicide called Pylex we used on the rough is doing great work on some of the areas but will need to be applied again next week. We then intend to drill seed Turf-type Fescue into these areas to improve our cool season competition and give us better turf cover. We also need to make another application on our collars, approaches, and green/bunker surrounds. These late season applications will hopefully set up the Bermuda for some winter kill. We have 5 cool season tees, 2,3,5,10 blue, 11 white and 14 left tee. We had a disaster in crabgrass management on a couple 5,11 and average at best on 2,3 and 10. We used our walking drill seeder and drilled rye grass into all the tees except 2/3 which have a mixture of bent grass and poa annua. 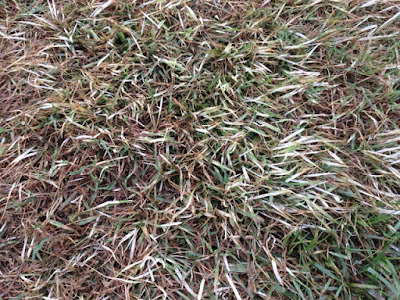 The rye-grass should give us improved cover and has damaged the crabgrass. We will definitely be on top of getting these tees sprayed next season to eliminate this issue. The 8th main tee has shown some improvement over the last few weeks. I deep-tine aerated it 4 times over the last month and we put about 300# of compost on it to improve it over all health. The aeration should help reduce its moisture level over the winter and improve its overall health. We might also close it down some this winter and move play up to the red tee just to reduce traffic. We do this on a number of our smaller tees to help reduce wear and tear when the turf is not growing. Becky is in the process of replacing the verandah planters with Mums for this fall. It think the planters looked great this summer and added some contrast to this area and the clubhouse in total. We plan on putting some tulips in them for the spring to give some great color to the balcony as life begins to awaken from a long winter's nap. We will also be evaluating the long range tee for wear and determining a closing date for it sometime in October. I continue to encourage those of you who like to practice to use the long line method of divot removal from the tee than completely clearing a 1 or 2' square area of turf. That spot will not grow back until at least next June if completely removed. We intend to finish placing the netting on the poles and shortening the poles to a little under 30' before the end of October. Trying to close the range during the season and doing the work with all the other work was not realistic for our crew to manage. Randy rolling the greens. What are the greens stimping is the question posed. Probably too fast for most of us. As you may have noticed this past week, the best greens of the season should take place over the next 30 days as long as the rains don't get too heavy.We are looking at completing our deep aeration on the greens the week of October 19th or 26th depending upon weather conditions. This should give you at least 4 weeks of unencumbered joy on this lightning fast greens. (Yes my tongue is firmly planted in my cheek) Cooler temperatures, lower humidity, longer nights all contribute to great ball roll out and many challenges on our greens. 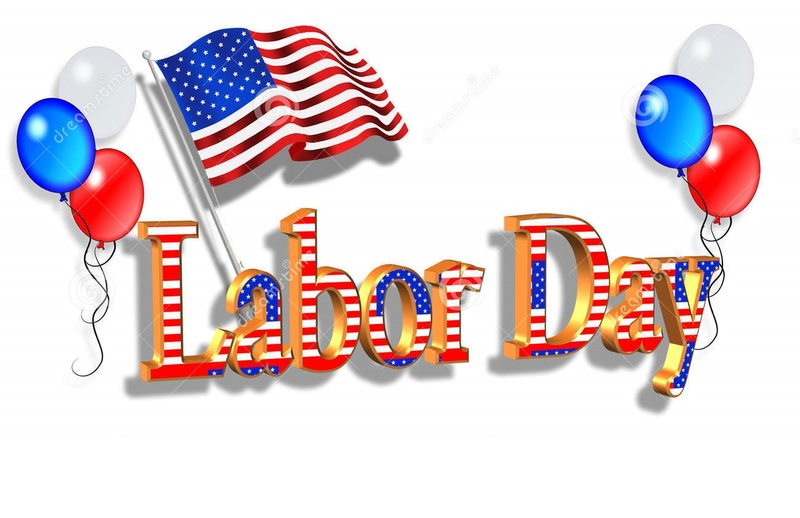 We hope many of you take advantage of the next month. The battle of the leaves is usual at a smaller level until the end of October or early November anyway. 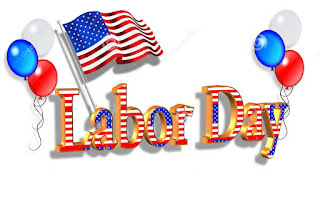 We appreciate your support and look forward to seeing you out on the course. Lady had a great time at her pool party as did all the dogs that I could see. I'm sure there were some tired pups that night. She only had to growl down one youngster who was just showing her some love but was a little to rambunctious for her taste. After a tough day, the enthusiasm that our pets show to us can give us pause and comfort from the difficulties we sometimes experience during our work time. The Echofest, our Men's Premier Member/Member Tournament begins on Friday with 2 rounds and a full Lobster dinner/auction on teams. Saturday includes 2 rounds and Shootout to determine our overall winners. 2 days of food and drinks and 4 rounds of golf. As of yesterday Matt was still looking for a couple of players to even out our field. Staff is geeked up for this event. Mowing rolling today with s light topdressing and brushing. Hopefully a flood stays away in next couple of days. Temperatures appear to be outstanding for later in the week. Course should be in outstanding shape for this event. I mentioned in video posts last week that we were expanding our Bermuda Eradication work to the rough with some newer herbicide chemistry called Pylex. 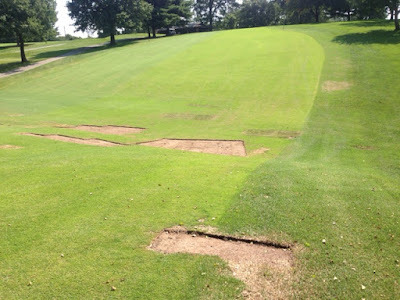 Some might question why would you ugly up areas of the golf course like we have when the course was near perfect. 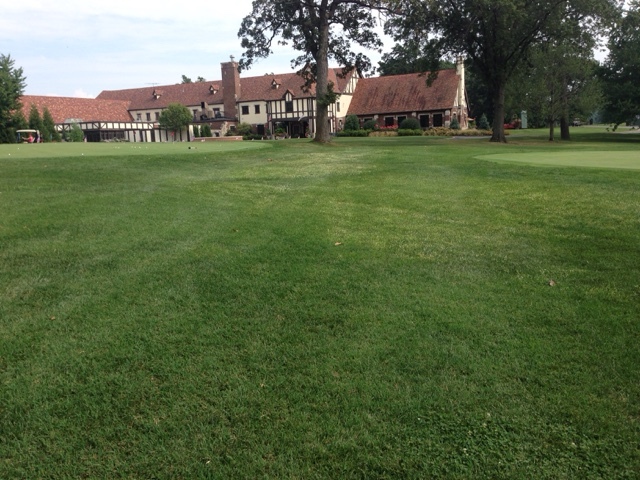 First off, the club spent 1/4 million dollars to install Zoysia 20 years ago. We need to protect that investment. We've spent well over $10k over the last few years spraying fairways, adding Zoysia and the labor required to install the new sod. The efforts on our fairways must extend into our first cut of rough because Bermuda wants to move into areas of least resistance. It will continue to try to push into fairways. We must push it back or at least keep it at bay. 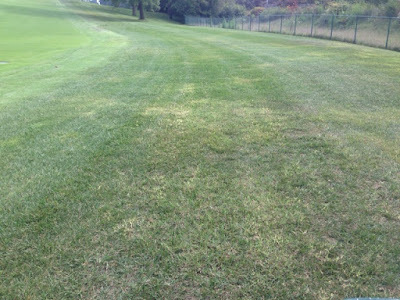 There is probably one grass more aggressive than Bermuda and its poa annua which is most adapted in shade. 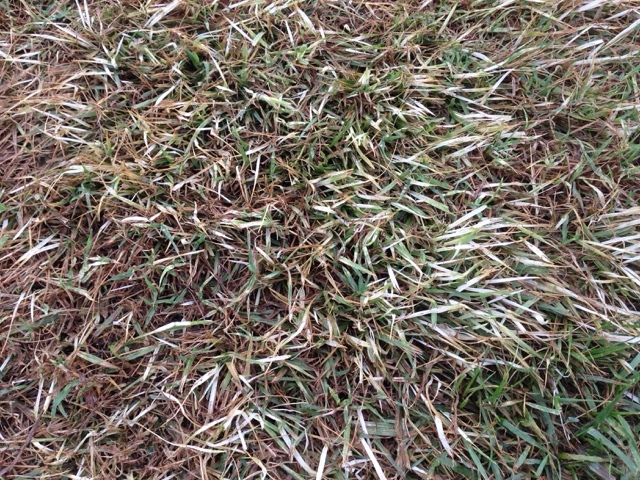 Bermuda grass is subjected to winter kill in our area about every 5 years or so. This damage leads to delayed green up of our fairways. Reduction of Bermuda in our first cut of rough is also important because of the difficulty in playing out of this grass in the late summer. The less Bermuda, the better playability and for our members and guests. The last week of August I sprayed varied rates of a product called Pylex from BASF. The rates were from .25 oz/acre on bent grass collars/approaches to 1.5 oz/acre to our main rough. 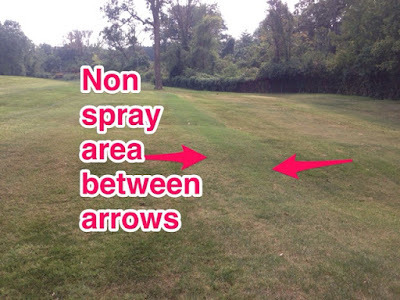 I used our large area spray unit on these areas to insure proper calibration and application. The white color of the leaves is caused by the disruption of chlorophyll production in the plant which gives the plant its green color. It has less activity on cool season grass but there is some activity. Also the secondary herbicide I used also has activity on the cool season. Parts of collars on 3,4,5,6,7,9,10,11,12,13,18 were sprayed. 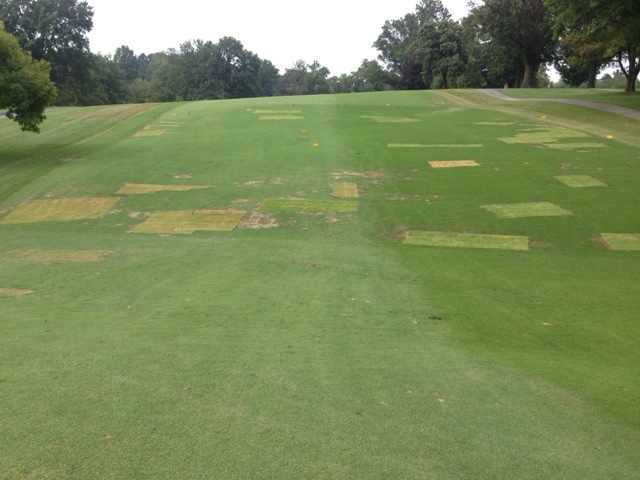 Rough was sprayed on 1,2,3,4,10,16-18. Bunkers/Green surrounds were sprayed on parts 4,5,7,9,10,11,12,13, and 18. This chemistry has serious activity on Zoysia as well which is a warm season grass. Greens collars such as 1-3 will require backpack applications in the next few days because of close proximity of Zoysia directly off the green. 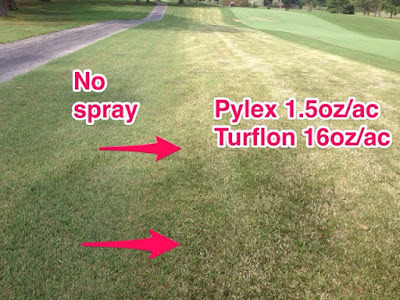 The rough was sprayed with an additional herbicide called Turflon which can reduce the amount of white discoloration caused by Pylex but it does have additional activity on the Bermuda and will turn it red. I've sprayed 6 acres of first cut rough and about 1 acre of collars, tees, and green surrounds. The rough areas I intend to drill seed Turf Type Fescue into these areas in the next couple of weeks to encourage additional cool season grass and discourage the Bermuda. I will expand the applications to additional rough in the next week to 10 days as well as other green surrounds. We do not have an unlimited supply of this material so don't fear, I will not spray the total course with this material. This is an area near the dogleg of #1. This was a much lighter rate of Pylex that was applied without the Turflon added. Its having an effect but a slow one at that. You can see the Bermuda beginning to turn white. 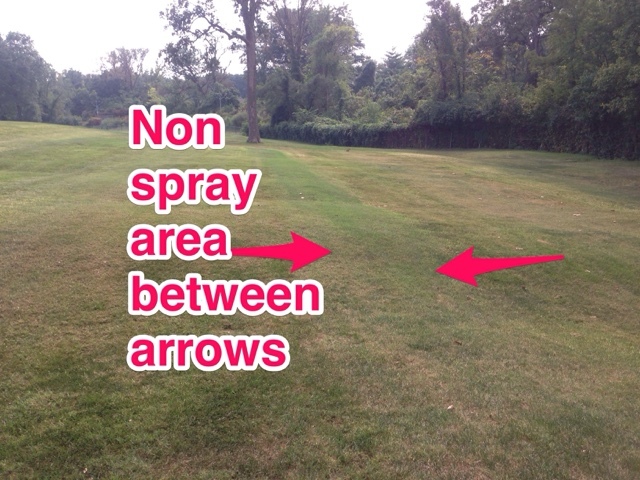 This is an area on the right of #1 where I usually dilute and spray extra product out of my tank. You can see the green strip of no activity where I skipped an area in the rough. The cool season rough is tolerant of the spray but the mid-90 temperatures of this week has made its activity on the cool season turf a little more pronounced. This is the area off the tee on 16 on the left. This is a 1/2 rate of Turflon. With warmer temperatures predicted, I decided to cut the rate in 1/2. More activity on the cool season grass than I wanted but it should calm down over the next few days with rain and cooler temperatures. 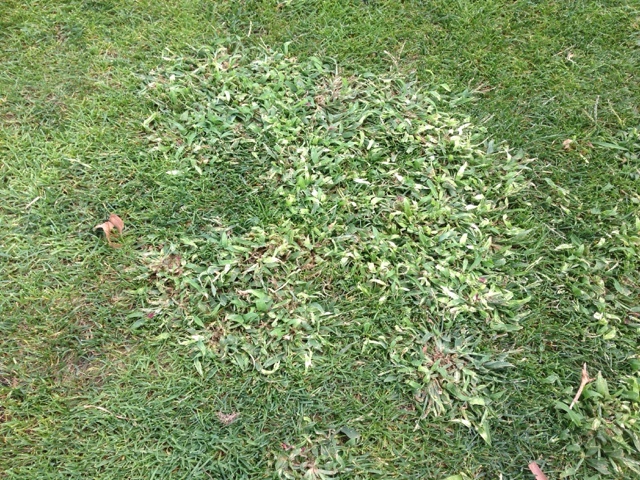 This is activity on the 2nd tee on some crabgrass which is cut at 6/10" about twice as tall as our collars. Pylex has activity on multiple grassy and broad leaf weeds which is an added benefit. Goose grass on 2 tee. 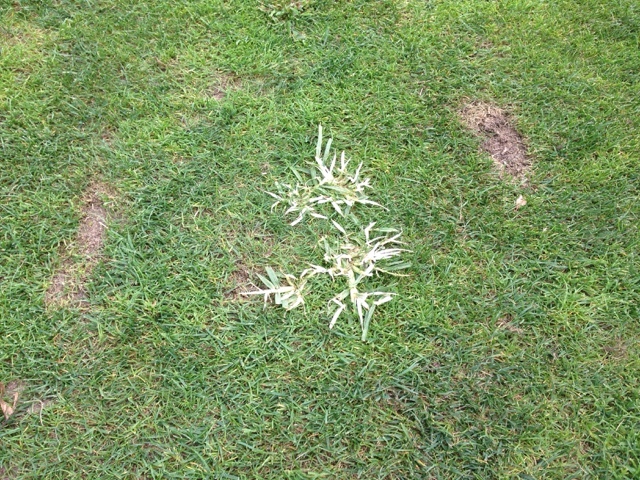 Great activity on goose grass. This is the back of 5 green. The red is Bermuda grass. Most of the white on the right side is activity on the Fescue around this green but I expect this to come out in the next week or so. This is activity on the right rough on the tennis court side of 18 near the right bunker. It has smacked the Bermuda in the mouth! This is activity around the right bunker. This was sprayed without the Turflon material. This is behind 18 green where we have some Bermuda as well. Part of our Fairway eradication has involved sodding as well. This is over the hill on 10 about 125 yards from the green. 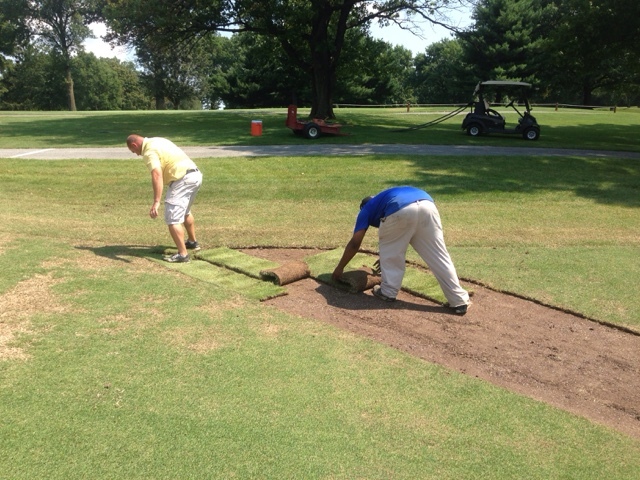 Guys removing sod on Thursday and installing new. In the same area installing new sod. Additional spots waiting for more sod on Friday. Repaired areas beginning the healing process. Did not remove every little spot of dead Bermuda. 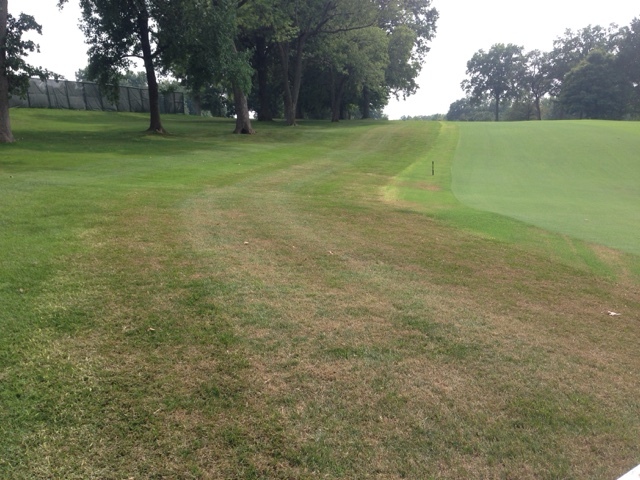 Expect the Zoysia to fill in the smaller areas by next season. If we spray and kill more Bermuda next to these areas and larger patches are showing, we will cut them out next season. 180 yards of new Zoysia in this area. 360 total yards laid this week. Well over 20 pallets of sod plus some removed from our nursery as well this season to repair treated and or winter killed Bermuda. Hope you've had a great weekend so far with part of today yet to go. A great deal of activity at the club this weekend and hope you have had an opportunity to join in the fun. Its been pretty toasty on the course so we've been here in the afternoons hitting spots on greens as necessary. Staff was in this morning and mowed a lot of the playing surfaces, at least everything we could do in 4 hours so we could get out of the way and allow you to enjoy a peaceful day on the course. Still a lot of activity this fall on the course and in the clubhouse. Check out the weekly calendar from Jason for all the events. Make your reservation soon. This is the high society, cultural, hooty tooty event of the season if you get where I'm coming from! If you don't want to play in the tourney, you can still bring your pouch/pouches to the pool for a fun time and some great food by Chef Terry and his staff. I know Lady is looking forward to it, well, let's say she's coming, she'll have to tolerate all the youngins invading her territory! Foot Golf has been sweeping the World, um well North America?, okay These United States, you got me St. Louis the birthplace of soccer!, well okay Glen Echo for this weekend and the rest of fall! We set up a little 4 hole course on the club lawn for your kids, grand kids, or kids at heart to have a little fun kicking that round soccer ball into a 15" hole. Now, if we could only have these on the greens it would be a smashing success. Rob purchased six balls for folks to use but if you want to bring your own, it might not be a bad idea in case we are swarmed over with excitement and players! Quick hitting video regarding the Bermuda Eradication Work. Also staff installing 4 more pallets of Zoysia over the next couple of days on 7 and 10 Fairways respectively. Please be aware of signs directing you around these areas. 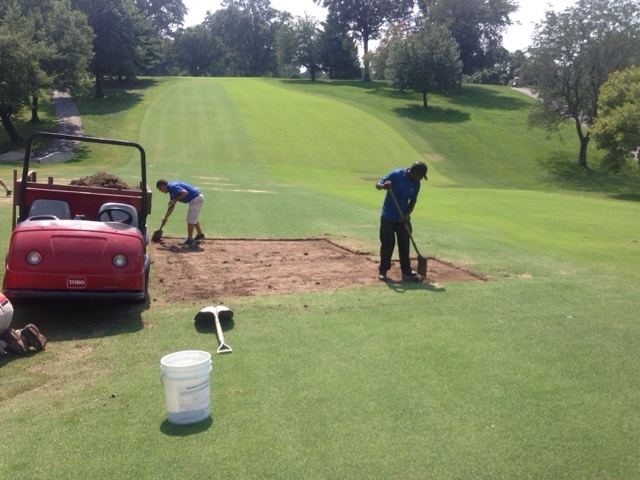 Staff working about 125 yards from 7 green in the valley today removing Bermuda sod and replacing with Zoysia. Finished look on 7. About 150 yards on 7 and the rest will be placed on 10 on Wednesday.